The weather has been absolutely wonderful here, and its a long weekend. Which makes it better yet. although the weekend has flown by. 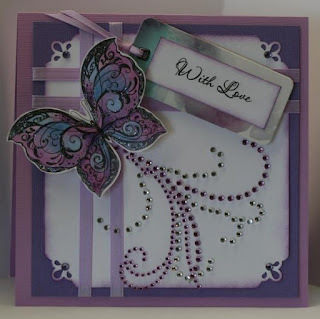 I made this card with the beautiful digital image from Whimsy Stamps designer Crissy. It's called Butterfly Flourish Set 2. It comes with a side view digi as well. They are very elegant images. I loved, loved, loved working with it. I decided to use soft pastel colors for a change. I typically used bright bold dark colors. I like he end result that I got. The tag is actually a tag off a blouse that I bought. 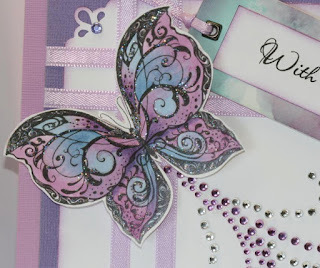 I loved the colors on it and thought it would work great for a card or a scrapbook layout. The colors matched this card perfectly. Then I just stamped the sentiment on a piece of paper distress inked the edge and glued it over the words that were on the tag. Here's my card, I hope that it helps you find your creative inner side today. a closer look at the image, colored with copic markers. Love your colors and the image is wonderful, very pretty! Nicely done friend! Hey Charlene it is awesome to see you at our challenge this week. Love, love, love the colors, your image is rockin and your multi flowers are totally cool. You make using flowers super easy!! Thank you for sharing your flowers with us at 4 Crafty Chicks.